This talk will be on Thursday 23rd January, 2014. Coffee and tea will be available from 7:00pm with the talk to start at 7:30pm. We do not currently have any upcoming talks. 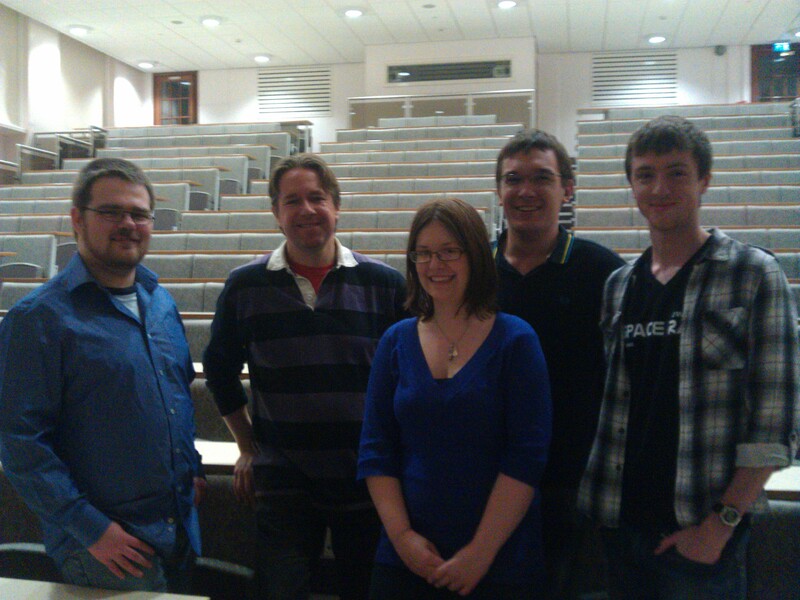 Sue Horne, MBE "2013 Space highlights and future challenges"
Professor Trevor Ponman "How hot is the Universe?" 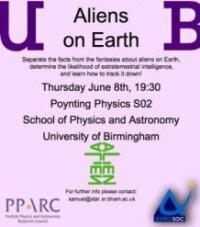 Dr Robin Catchpole "Climbing the Distance Scale ladder to the Edge of the Universe"
Professor Mike Cruise "Small Problems with the Universe - is Physics letting us down?" Alastair Reynolds "From Barsoom to Pandora: Science Fiction and Astronomy in dialogue"
Lucy Hawking "George's Cosmic Treasure Hunt"
Lucy Hawking she presented a young person's guide through the galaxy. 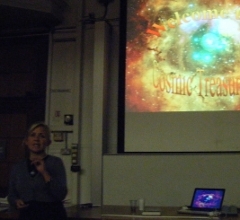 The talk was primarily based on her latest book, `George's Cosmic Treasure Hunt,' the follow-up to the brilliant 'George's secret key to the universe'. We explored the mysteries of physics, science and the universe with George, his new friends next door - the scientist Eric and his daughter, Annie - and a super-intelligent computer known as Cosmos, which can take them to the edge of a black hole and back again. Dr Samuel George - "It all started with a big bang - a journey from the solar system to the beginning of the Universe"
The observable Universe is 27 Billion light-years in diameter. Over 1 million Earths would fit inside the Sun's volume. Pluto is some 13 light hours from the Earth. In this talk we take a photographic tour of our Universe, exploring the wonderful different objects in the Universe and the awesome scale of it all. David H. Levy - "Poetry of the Night: A marvellous union between science and literature"
"Poetry of the Night: A marvellous union between science and literature" - On October 2, 1605, Londoners were treated to an almost total eclipse of the Sun at around the same time that Shakespeare's King Lear was exploring humanity's relation to the cosmos. "These Late Eclipses in the Sun and Moon" (a passage from the play) begins a sophisticated discussion of that relation, based on real events in the night sky. This is just one example of the richness of astronomical allusions in English Literature that was discussed in this talk. Prof Peter Kalmus OBE - "Mirror images, antimatter and time reversal"
"Mirror images, antimatter and time reversal" - At the microscopic level, the laws of mechanics and electromagnetism appear to be perfectly symmetrical, but the symmetry is broken by the weak interaction, the force that allows the Sun to shine. We explain how symmetry breaking could help us to avoid being annihilated by a science-fiction antimatter alien from another world. Again at the microscopic level there is a small asymmetry between the forward and backward directions of time. On larger scales however the direction of time is crucial, and time-reversed systems generally lead to absurd situations. 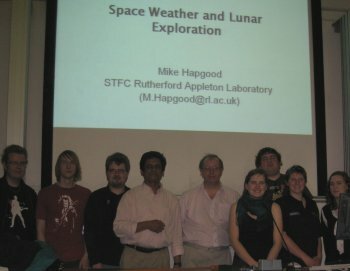 Dr Lucie Green - "Living in the Sun's atmosphere"
Dr Mike Hapgood - "Space Weather and Lunar Exploration"
"Space Weather and Lunar Exploration" - a talk about how space weather affects our lives and determines how we continue our manned exploration of space. Space is a dangerous place for humans, once we step beyond the protection of the Earth's atmosphere and magnetic field. Galactic cosmic rays and bursts of charged particles from the Sun damaging to health happen with alarming frequency - the Apollo astronauts were lucky. Understanding the physics of radiation from distinct source in space will be useful to help future space voyagers plan journeys in greater safety, and produce effective shields for these unavoidable events on journeys to Mars or beyond. Dr Martin Hendry - "Did we really land on the Moon?" "Did we really land on the Moon?" 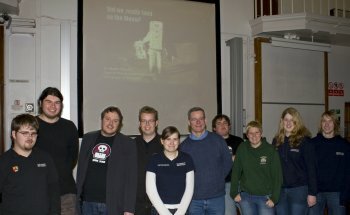 - a talk about the Moon landings and some of the hoax theories that have arisen. Did Neil Armstrong really walk on the Moon? Almost 40 years on from Apollo 11 a surprising number of people believe that Armstrong's famous "One small step" was an elaborate hoax, filmed in secret here on Earth. Conspiracy theorists point to a range of "evidence" to support their claim: waving flags, strange shadows, no stars in the sky, deadly solar radiation. 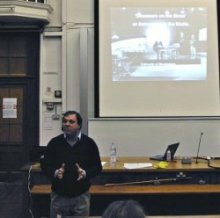 In this talk, using real Apollo video footage and a series of simple demonstrations, we will take a closer look at the science behind "moon hoax" claims, and ask whether we really did land on the Moon. The answer to the question was given quite clearly at the start with an emphatic, "yes!". Dr Paul Roche - "The Faulkes Telescope"
"Faulkes Telescope" - a talk about the The Las Cumbres Observatory Global Telescope Network and how it is opening professional instrumentation to children worldwide. 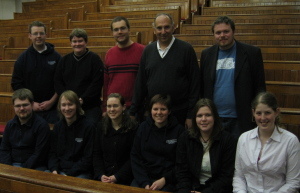 Dr Paul Roche is the director of the Faulkes Telescope and a University of Cardiff Lecturer. The Las Cumbres Observatory Global Telescope Network (LCOGTN) is an independent, non-profit private operating foundation based in Santa Barbara, California, that is building a global network of remotely operated telescopes, to be used for both educational and scientific research purposes. LCOGTN operates the largest telescopes in the world partially, but consistently, devoted to astronomy education. LCOGTN is building a global network of 18 x 1-meter diameter telescopes (the Research Network - 18 'scopes in total) in clusters of 3 at each of 6 observatory sites. It will initially deploy clusters of 4 x 0.4m diameter telescopes at 7 observatory sites (the Education Network - 28 'scopes in total) distributed around the world, over the next few years. Dr Brian Cox - "The Big Bang Machine"
"The Big Bang Machine" - a talk about the Large Hadron Collider at CERN and how experiment can reproduce the early Universe. 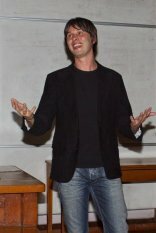 Dr Brian Cox is a University of Manchester and CERN experimental physicist. He is involved in various radio and television shows - including Horizon and Billon Dollar Experiment on BBC. He was also the scientific consultant for the sci-fi film Sunshine. 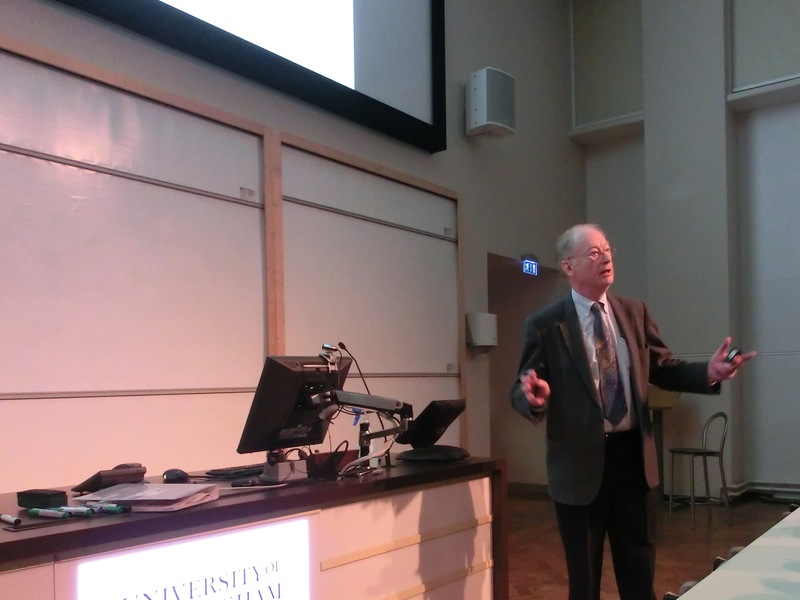 Prof. Ian Morison - "Is There Anybody Out There?" 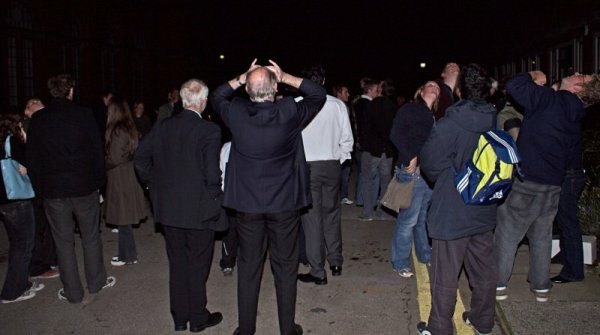 Prof. Ian Morison (Gresham College and the Jodrell Bank Observatory) discussed how most searches for life outside of own world have so far used radio telescopes, but that now it is possible for high energy pulsed lasers to outshine a star for brief periods so that optical searchers can take place. He also discussed why no extraterrestrial beings have be found so far and he looked to the future at plans to establish a dedicated radio telescope in California and a giant radio telescope array that would be able to search the whole galaxy. Prof. John Brown - "Black Holes and White Rabbits"
The 10th Astronomer Royal for Scotland and Regius Professor of Astronomy in Glasgow, Prof. John Brown, gave a rather interesting introduction to the physics of black holes. 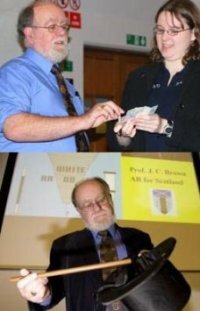 Not only is Prof Brown an astronomer he is also an accomplished magician and for one it was obvious from the title of his talk, "Black Holes and White Rabbits", that he might well include this. 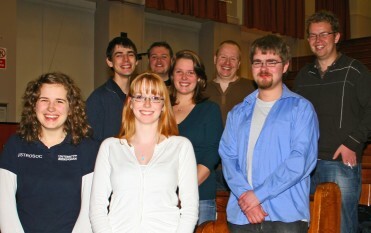 The crowd of over 200 people from the University and general public were not disappointed. 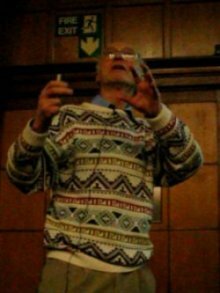 He used his magician skills to good effect as he showed how one can visualise complex physics by using his skills of illusion. He did conjure something out of a top hat but not the object one would suggest from the title. Instead he went much further than just producing a rabbit out of his hat, he produced an entire Universe for us all to see and wonder at. 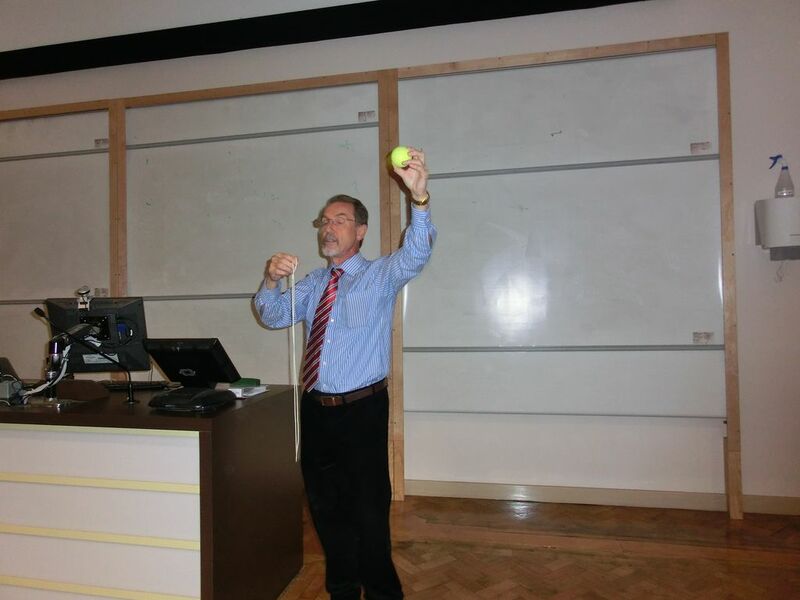 Dr David Gregory - "Do you want to be the next Robert Winston?" BBC West Midlands Science Correspondent Dr David Gregory talks to us about science in the media and how scientists should approach communicating their work. He used a variety of techniques including interviewing an enthusiastic member of the audience to show how hard it is to communicate the correct info and for the journalist to extract it. Mr Mario di Maggio - "Aliens on Earth"
Is their life outside the Earth? A question which has preoccupied many conversations in the modern quest for understanding of our own existence. In this talk the Director of the ThinkTank Museum's Planetarium, Mr Mario di Maggio, discusses if their is Alien life on the Earth, and not just the little green men kind. He separated the facts from the fantasies about Aliens being on Earth, discussed the likelihood of extraterrestrial intelligence existing and if so how should mankind go about trying to track it down? 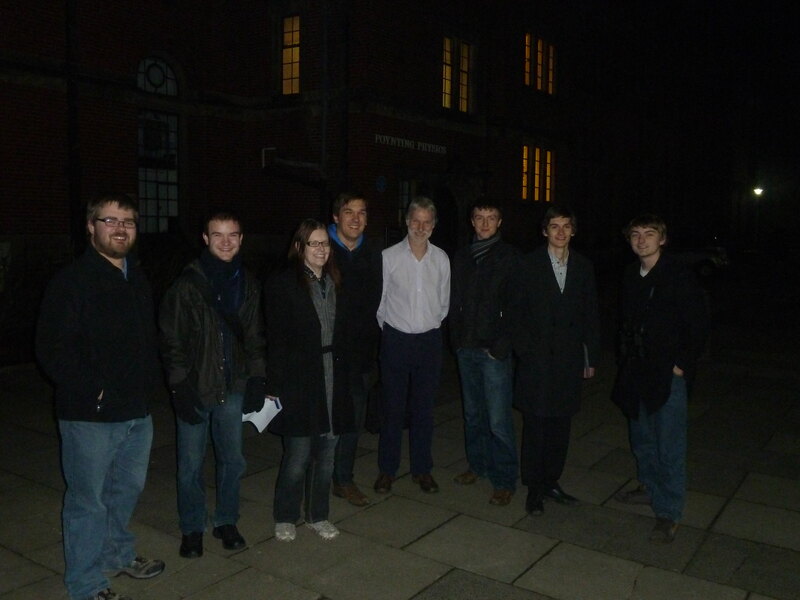 Dr David Whitehouse - "Dinosaurs on the Moon: Astronomy and Space in the Media"
Are their dinosaurs on the Moon? BBC Science Correspondent and Science Editor of BBC News Online Dr David Whitehouse puts the science media under the microscope. This talk gave a unique insight into how the media have handled many scientific stories. A couple of key events were used to illustrate how the media can cause scientists to have a rather bad time. A good example is the loss of Beagle 2 which caused a media flurry due to scientists handling the situation in a less than brilliant manner. The title story, "Dinosaurs on the Moon", was also discussed and is an excellent example of the media playing around with scientists and how emphasises how scientists need to ensure that they understand how the media will interact with them. Dr Fred Watson - "When telescopes go bad"
Dr Fred Watson of the Anglo-Australian Observatory talked about what can go wrong when trying to construct telescopes. In anticipation of the telescope's 400th birthday, in this entertaining and fully-illustrated talk, Fred Watson looks back at some of the world's worst and best telescopes, and asks what makes a productive astronomical instrument. Fred Watson is Astronomer-in-Charge of the Anglo-Australian Observatory in Australia, where he is well-known for his award-winning astronomy segments on ABC radio. 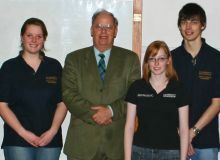 His book "Stargazer - the life and times of the telescope" was published in 2004. 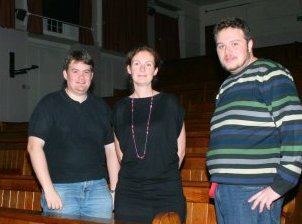 This talk was part of the Allison-Levick Lecture Series. For more information about Fred Watson and his book see his webpages. 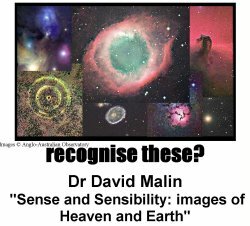 Dr David Malin - "Sense and Sensibility: images of Heaven and Earth"
Dr David Malin (of the Anglo-Australian Observatory) is a pioneer of astrophotography and a large fraction of the spectacular astronomical images that are found as posters are a result of his work. His technique of enhancing faint features on photographic plates, known as "Malinization" after him, makes this possible. In this talk he will discuss some of these beautiful images and how taking them was made possible. 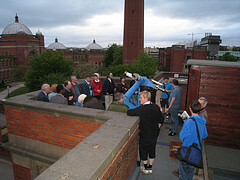 This talk was arranged to commemorate the 20th anniversary of the University of Birmingham Observatory. For more on his work see his website.